Peru's Ex-Police Chief Arrested In Alleged Baby Trafficking Ring The former police chief is among 14 people swept up in a raid and accused of buying infants of poor women. His partner, a well-known model in Peru, is considered the ringleader. 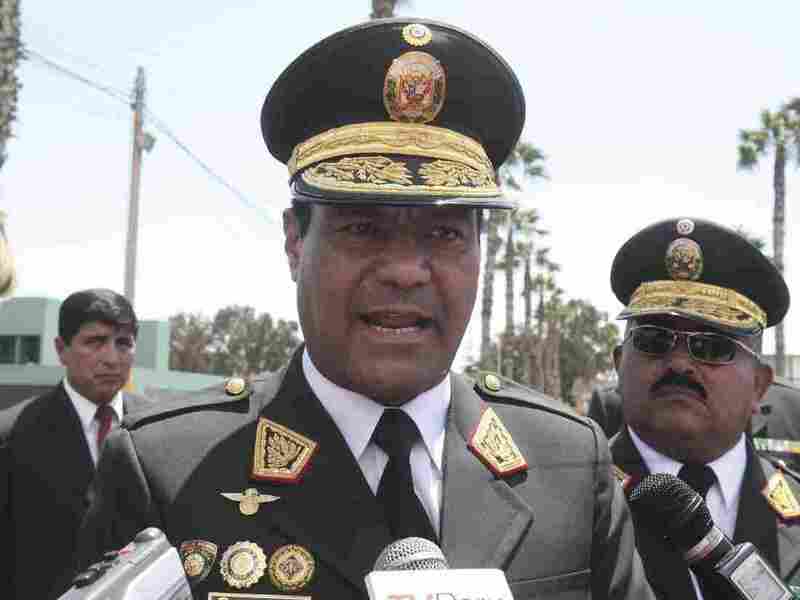 Gen. Raul Becerra, pictured in 2016, is the former head of the national police force of Peru. He was arrested on Tuesday for his alleged involvement in a child trafficking ring. The former director of Peru's National Police was among 14 people arrested early Tuesday morning in a series of raids that rounded up alleged members of a baby-trafficking ring. Police Gen. Walter Ortiz told the Associated Press Becerra's partner, Cinthia Tello, is believed to be the head of the trafficking ring, which authorities are calling "The Soulless Human Traffickers." The 32-year-old woman, who is also known as Caroline Preciado, is a well-known model and events producer in Peru, El Comercio reported. The local newspaper said the child was found in one of Preciado's homes and that she had paid the baby's mother 4,000 sols — nearly $1,200 — for the infant. The child's parents are among those arrested. A gynecologist and a pediatrician were also picked up in the sweep and are in custody, as well as a handful of women who acted as recruiters for pregnant women. Prosecutor Rosmery Mendoza Palomino said in a Twitter video that the investigation into the group's criminal activities began in May. She called the operation a "100 percent success," adding that the 14 now in custody make up the entire gang. "Police are still investigating whether the children were sold to foreign couples looking to adopt or to organ trafficking gangs," the BBC reported. Becerra, 61, led the national police force from 2010 to 2011, when he retired after being accused of sexually harassing a subordinate, according to Al Jazeera.